December 21st is the shortest day of the year, the winter solstice. That has absolutely nothing to do with the pace of software freedom. Programmers have been working steadily to release a new office suite called Calligra, a part of the KDE software selection. KDE itself is continuing to innovate with a rework of Plasma that will run on touch interface computers like a smartphone or tablet. Gnome is moving ahead to improve the 3.x experience of Gnome Shell and the Ubuntu coders are busy making improvements to the capabilities of Unity. MOSS SIG itself did encounter a winter solstice effect. 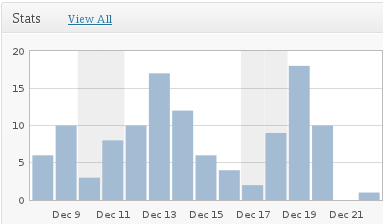 This blog has low traffic anyway, but the solstice impact was real. If you look closely, you will see that there were zero visitors on the 21st. Everyone must have been off having a celebration, right? Well, I won’t be a grinch about it. Merry Christmas to some of you. Happy Chanukha to some more. Happy Holidays to everybody. I’m going to celebrate every way I can because software freedom has been very good to me this year.